While universal print drivers (drivers that support multiple printer models) are nothing new, they've had a history of being fairly limited. One example would be HP's UPD that comes in PCL 5, PCL 6, & PostScript flavors, but they only work across HP branded printers. On the other hand, Xerox's Mobile Express Driver can print across manufacturers and models, but it only supports printers that allow the PostScript page description language (PDL). Installation was a snap. First of all you have the typical "where do you want to extract the driver and installer files to" page, language options, destination folder, etc. The next thing you have is an option to select a "typical" or "custom" installation. 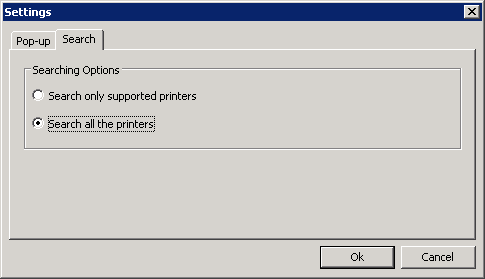 The typical option would be for home users where the printer is connected directly to the computer. Most enterprise users would want to select custom installation mode which gives you the choice of whether or not to install Samsung's "Smart Panel" software (Figure 1). If you just want a driver that is compatible across multiple printer models, you can choose to install the driver on its own. If you want to also have the option of using the Smart Panel, which gives you the ability to see status pop-ups (only available for some printers), you should leave that component checked. The first thing you will notice is that a "Samsung Universal Print Driver" (UPD) device is added to your printer list. What's cool is that you can have just this one "printer" installed, but have it point to any number of printers. Unfortunately, this doesn't migrate down to other computers if you choose to share the UPD printer; you would have to install the driver software on those computers through the installer as well. Still, it's a neat feature and it's fine if you want to use the UPD to manage just your personal computer. In addition, you can use it on the print server to assist in creating other printer queues that use the Samsung UPD (not that it's hard to manually add a printer driver and create an IP port for a networked printer, but it saves some time). If you open Properties or Printing Preferences on it, the main UPD window opens. At first it doesn't show any printers listed, but it gives you the option of searching for printers on your network automatically (Figure 2). By default it only searches for supported printers, which I can only assume are Samsung's own models. If you open the settings, though, you can change the UPD to search for all printers it can detect (Figure 3). After we changed this setting, another search resulted in the list being populated with all off our printers (Figure 4). 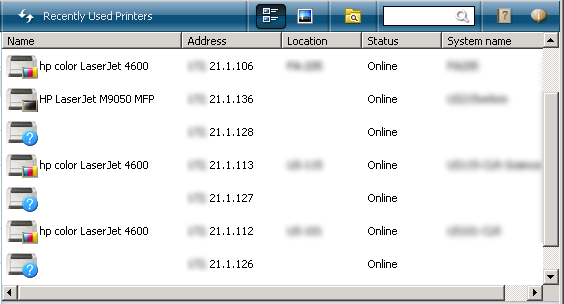 The UPD window conveniently has the ability to list both recently used printers & recently searched printers. Another feature is that you can create multiple favorite lists of printers. This would be useful if you want to see a different set of printers depending on your location. One bug we noticed, though, was that when we went back into the UPD window after closing it out, the recently used printer list showed the printers, but had question marks and empty model names for a number of them (Figure 6). If we navigated to the recently searched printers list, it showed all of them properly, as did our favorites list. The UPD window also has some features that improve display and usablity such as grouping & sorting the printers or searching for a specific printer based on a keyword like a model name. Everything looked polished except when there was no printer status, which usually was the case for all of our printers since they were not manufactured by Samsung. When status information was unavailable there would be a lot of empty white space with just a separator line where it normally would separate printer information, making the software seem a little incomplete. 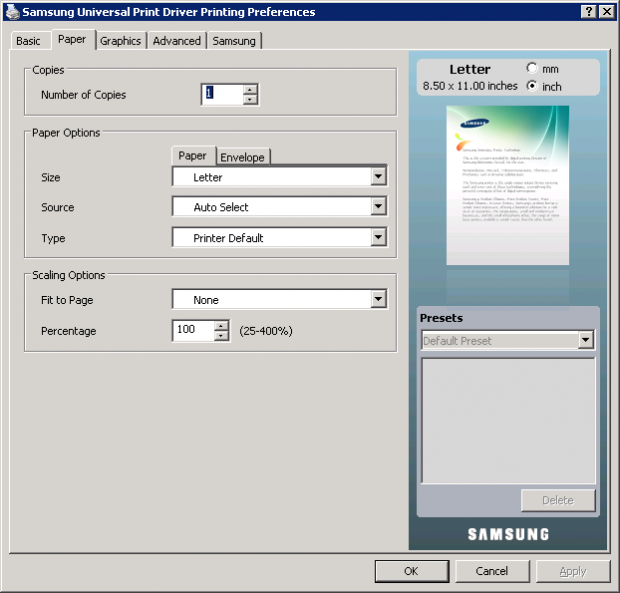 While you can manually share any printers and just apply Samsung's driver to them, the UPD window allows you to easily create a printer along with the standard TCP/IP port that you would use to connect to a networked printer. Then you could share the printer the same way you would any other printer. The process is as simple as right-clicking on the desired printer and selecting "Add to printer folder" (Figure 7). One [probably intentional] annoyance I had was that the default name for any added printers is "SUPD_" rather than being based on the model or location or some other feature (Figure 8). Albeit, this is a very minor issue since you can just rename the printer later. The other issue I had that was if you tried to add a second printer to the folder, you would get an error (Figure 9). 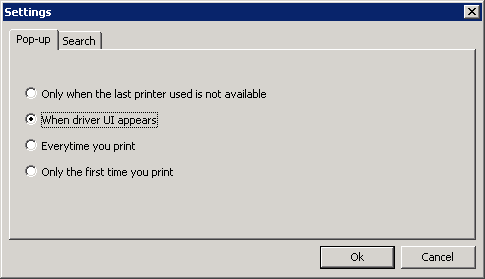 If you exit the UPD window and reopen, you can then successfully create another printer. One thing I noticed is that installing the printer from a shared source or even applying the driver to a printer directly on the print server went fairly quickly, especially compared to the HP universal printer drivers which take an annoyingly long time to install. Multiply that by a large number of printers and you can see where the slimmer Samsung drivers are much better in this regard. While the printer driver from Samsung supports nearly all types of printers and can detect basic options (e.g., whether or not the printer can output color, print duplex, etc.) it cannot detect advanced printing features on non-Samsung manufactured printers such as finishing options. Still, the preference pages (Figures 10-14) have all the core features and everything is layed out very well. As for printing, there were no issues with performance, quality, or compatibility. Everything I threw at it came out just fine. While your mileage may vary, this really speaks highly for the programmers who wrote the driver protocol & communications code. As for the user guide (PDF format), it had all the basic instructions and was organized properly with a table of contents and clickable bookmarks for each section. It will get you started, but Samsung would do well to expand upon a number of features and explain how some of them are meant to work. 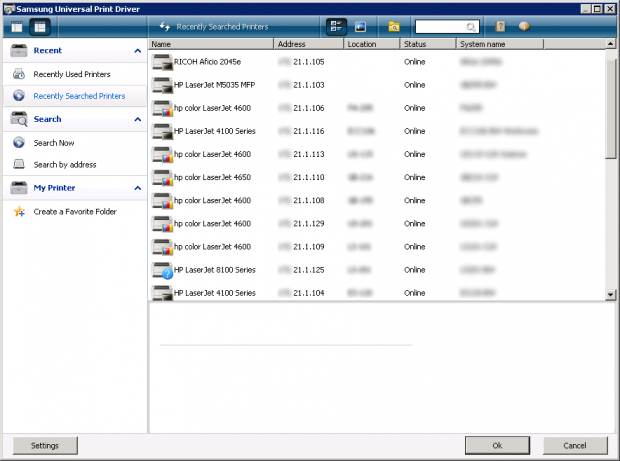 The one last consideration we had was related to our print monitoring and control software, Software Shelf's Print Manager Plus. 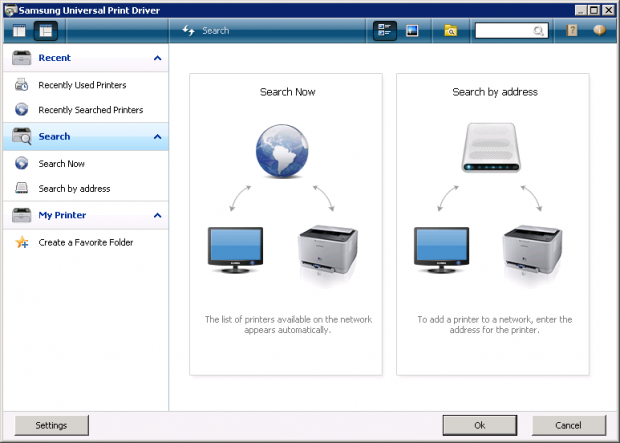 Since it separates printers based on devices (queues) listed in the printers list of the print server, when using the "Samsung Universal Print Driver" device, no matter which printer we pointed it to it would count them all as the same printer. This makes sense, and when we had separate printer queues for each of the different printers, it calculated the counts and other printout metadata without issue. During configuration, the UPD froze on me once and I had to end the process for the UPD window, but this did not cause any printers to malfunction or affect the Print Spooler service. This and the "add to printer folder" bug were the only glitches I ran into, so for an initial release I'm fairly impressed with the Samsung Universal Print Driver package. The only other complaint I had was that when trying to show the status of a non-Samsung printer in the Smart Panel system tray utility, it would usually say that it couldn't determine the status and show a red X through the system tray icon, making you to think something was wrong with the printer when in actuality the printer was functioning properly. If they had another icon displayed when printer status was unavailable (at least for "unsupported" printers), it would be an improvement we endorse. 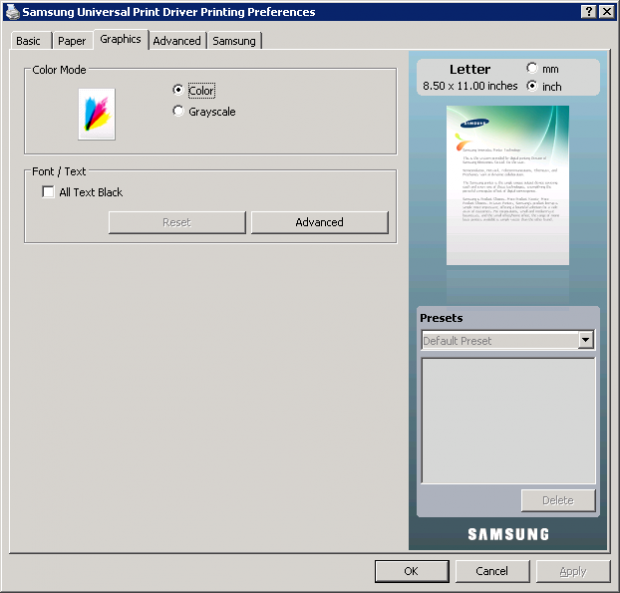 If you require only basic printing features and have a slew of different printer manufacturers and models yet still prefer your users to have clean, consistent printer preferences pages no matter which printer they are printing to, the Samsung Universal Print Driver could just be what The Grim Admin ordered. The drivers are definitely solid enough to push out in a production environment and doing so would also mean huge simplification for administering the print server and updating drivers since you would only need this one driver. On the other hand, if you require advanced printing features, you would want to use a driver that came from the manufacturer to fully integrate with all the special features of that specific model. Or you could combine those two options by using the Samsung UPD for most of your basic printers and the official manufacturer drivers for those printers that need advanced features, like your multifunctionals. Well, there you have it. The Samsung Universal Print Driver is definitely worth taking a look at, especially if you want to simplify printer deployments. 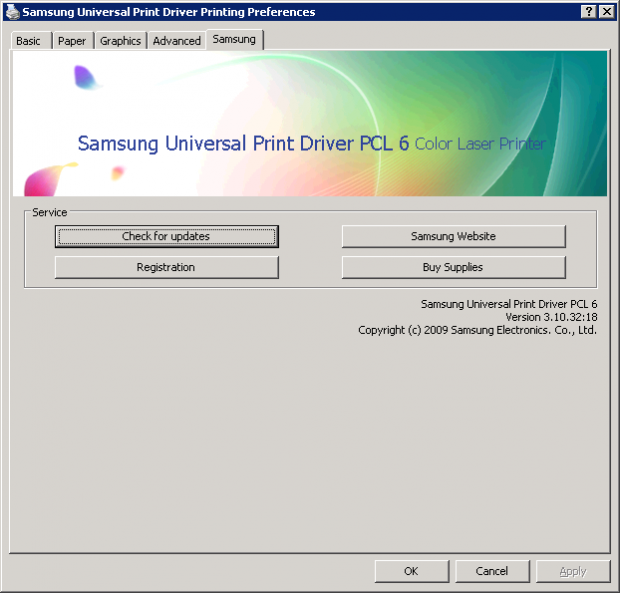 It is not without some user interface issues and lacks some features when used with non-Samsung devices, but the work-code and printing preferences pages in this driver are very well-made. Chat Information You are now chatting with 'Powell'. There will be a brief survey at the end of our chat to share feedback on my performance today. Powell: Hi, thanks for reaching out to Samsung tech support. How can I help you today? Roy: I need information on your Universal Print Driver software. Roy: Where can I get it and documentation for it? Powell: May I know the model number of the printer? Roy: I am just interested in the Universal Print Driver... I'm not trying to support a specific printer model. Powell: Would you mind holding a few minutes while I gather the required information on your request? Powell: Please open the following link which have information on this. Here is the link. Powell: Please check the link above and let me know if you have any further issues to be clarified. Roy: Thank you for the documentation. Powell: You're welcome. Is there anything else I can assist you with? Roy: Where can I download the latest version of the UPD? Powell: Just to confirm, you want to download latest version of the Universal print driver. Am I correct? Powell: Please click on the link below to download the universal print driver. Powell: Can I help you with anything else? Roy: Is there a main page that I can access that talks about the UPD? Powell: Is there anything else that I can assist you with? Roy: Thank you for your help. Powell: Thank you for chatting with us. If you have a minute, please click on the blue “X close” button to receive a transcript of your chat and fill out a brief survey to help us serve you better. Have a wonderful day! 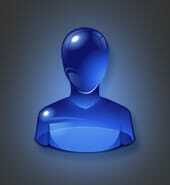 Chat Information Chat session has been terminated by the Samsung Agent. Please edit my email out of the prior comment. Thank you. Removed! Thanks for the information. Hope it helps someone else. The post was professionally written and I feel like the author has extensive knowledge in this subject. Nice post. ?????? ????? I took a look at the download in the link you were given and it looks like it's version 2.02.05.00:24 as opposed to the initial 1.0.0.0 release that you find on the original UPD page. If you are are looking for the most current UDP, you can often find it by searching the support site for a supported printer. Example: http://www.samsung.com/us/support/downloads/CLP-660ND (defaults to "manuals" downloads so click "drivers" link). This page has version 2.02.05.00:25 (Apr 2, 2010) and different releases: Win 2000/XP/2003/Vista/2008/Win 7(32,64bit) - PCL, PS, etc. Note that looking up the 'SPL' in the sentence "Late last year, though, Samsung announced a print driver that not only is compatible with their own models, but any network printer that uses SPL, PCL6, or PostScript languages." above means (according to Wikipedia) "Samsung Printer Language, specifications are available at http://splix.ap2c.org/"; (http://en.wikipedia.org/wiki/Page_description_language). Anything that requires Windows should not be called "Truly Universal"
Thanks very much for this great article; this is the stuff that keeps me going through out these day. You guys do a great blog, and have some great contents. Keep up the good work. It is a great website and nice share. I want to thank you. Good job. Efficiency of the students is due to the establishment of the institutes. It is rampant a needed at all costs and types. It is the need and requirement of the best dissertation writers times to produce and coin the skills of the students and individuals. Do you still pay for shopping at amazon.com? If yes then stop and use our fresh and working amazon gift codes to get item free or at amazing discounts. So what are you waiting for. Claim your code now and don't missed this opportunity. Universal Samsung driver is very important and necessary for the future of the computer users and all candidates. It is instilled college paper writing for the substantial and detailed progress and programs. It is the end and ultimate goals of the loves. It is established for the triumph and effectiveness of the lives of the citizens. how to make club flyers I discovered your website through Google while looking for such kinda enlightening post and your post searches extremely intriguing for me. Latest and Unique Indian and Russian Escorts Service in Kharghar For Dating, Massage and Sexual Meeting, Select Your dream girl and enjoy a day to night at an affordable rate. We provide Photo and Number for you.